Dr. Stephen Strange, MD was once a prominent but egotistical surgeon. Following a tragic automobile accident, he searched the world for a way to heal his badly damaged hands. After becoming a student of the Ancient One, Strange not only mastered the martial arts, but the mystical arts as well. He now serves as Sorcerer Supreme and from his base in the Sanctum Sanctorum, he guards the world against mystical and magical threats. Ages 18 and up. 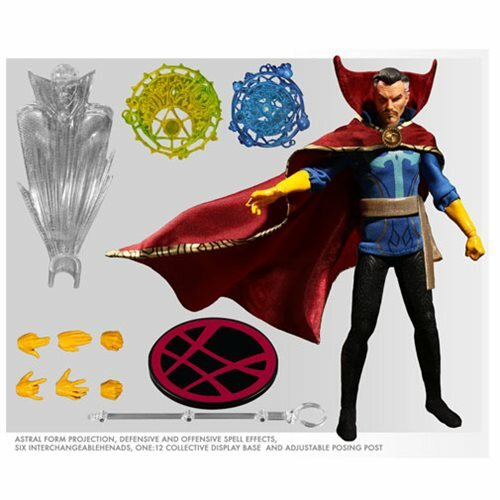 Doctor Strange joins the One:12 collective with a comprehensively detailed outfit and unique character-specific accessories. From sculpted gloves on each hand, to an integrated wire in his Cloak of Levitation, and 2x Eye of Agamotto (open and close), the intricately tailored cloth outfit is spectacular.